Situated in the stunning jungle scenery on the hill in Chalong near to the Big Buddha monument, 3.5km from Chalong Bay, this 8-bedroom villa basks in this stunning location. 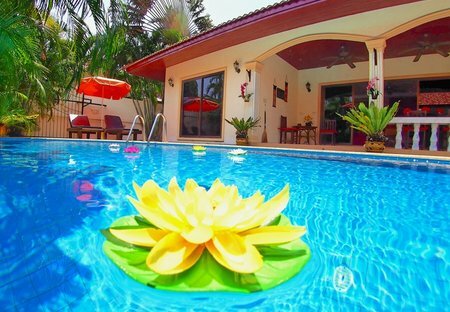 "PHI PHI DON" a Beautiful 3 Bedroom Villa Private Pool Villa. Modern sea side, with private pool. This elegant 5 bedroom home is located on a peaceful estate right next to Phuket's Layan beach close to the Banyan Tree Resort and a Laguna Phuket Golf Club. Those who take pleasure in European style summer residences with premium details will fall in love with this one-of-a-kind villa. The perfect living and recreational environment, through its combination of tastefully designed indoor and outdoor furnishings, along with ornaments the nature and diverse tropical paradise. Strolling around the massive perimeter of this holiday home's pool deck, guests will likely never want to leave the incredible accommodation offered at Villa Naiyang. 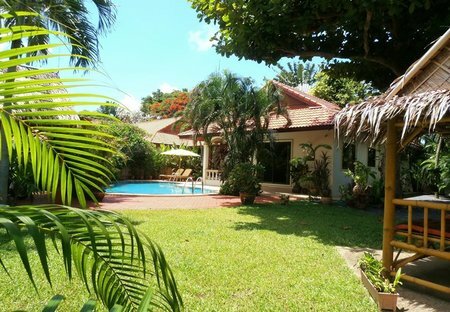 Villa Fullan is a spacious 2-storey gated property with striking design and contemporary fittings. The overwhelming brilliance surrounding this 7+ bedroom luxury villa on Patong Hill Estate is tucked into a tropical hillside overlooking the famous Patong Beach. Located just 1km from the dreamy Bang Tao and Layan beaches, this 3-bedroom villa is situated in the prestigious Laguna Phuket Estate.